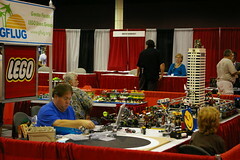 Here's an early set of photos from Mini MegaCon in Orlando, FL. I'm hoping that I'll have mine up tomorrow. It was a fun show, but I'm looking forward to doing the spring show; have lots of new ideas & and plans for next year's display. We might try to see if other clubs want to journey down to Florida for the weekend to put a display on, that's very Sci-Fi, comic, fantasy based.